The NBA's actual awards are nice enough, but also dull and subjective and mostly silly. Here are some subjective, mostly silly awards that don't actually exist. The trophies look expensive and all, but the NBA’s traditional awards are monotonous, emotional, and annoyingly subjective. Each voter comes to the table with his/her own definition of what the word “valuable” means when placed between the words “most” and “player;” many of these definitions are in near-conflict with the other. This isn't necessarily a bad thing in itself, but it lends the general debate over who's better and who's Most the effect of a very loud and not very fun funhouse. Nobody knows the right way to measure how a player has improved from one year to the next. The “best” coach and/or executive more or less never wins. Many fans respond to this, quite reasonably, by just opting not to care, or to cast their own votes with blasts of Twitter-snark. But while the whole exercise is silly, the voting process is similar to imprinting initials in wet cement—whatever goofy ideas might be behind it, it sticks. While we know these awards are goofy in the moment, they acquire a weird sort of luster after the fact—the ridiculous awards we joke about in real time are the same ones we cite as evidence in arguments about legacy and whether or not Player A was really better than Player B. Hall of Fame voters take them into consideration. These convoluted inconsequential things wind up consequential, even as and even though we know it shouldn't be. There are great ones—Miami and Boston, the Lakers and Boston, Los Angeles and Los Angeles, Oklahoma City and Miami, even Phoenix and Philadelphia—each is competitive in their own right and with games that are rightfully hyped up days in advance. But there is something different, something soooooo effing personal about the relationship between the Clips and Grizzlies. It defies geography—a couple time zones separate these conference rivals—and context. These are two teams with strong personalities, with each of those respective personalities having a palpable distaste for the other. Hate is a strong word, and one that doesn't really belong in discussions about things this cosmically unimportant, but at the same time it seems pretty clear that Blake Griffin and Zach Randolph kind of hate each other. 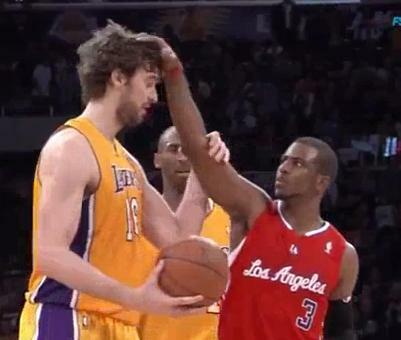 Marc Gasol can’t forgive Chris Paul for this or this. Every time they play it’s either competitive all the way through or—worst case scenario—wildly entertaining for long enough stretches to make it worth watching. The Clips are already two games up in their rematch in the playoffs, but the series—and the palpable enmity between the two teams—is not over by a damn sight. Right, there will never be a trophy for this. But if only because of the way his virtuosic hackery makes fouling almost fun to watch, there should be some recognition for Knicks rookie Pablo Prigioni. He's always there to snuff out a blooming fast break or wrap up a quick-footed penetrator who’s managed to blow by him towards the rim; he seldom seems to commit a foul without at least sort of meaning to. Prigioni just might be the smartest fouler in the history of basketball; he's certainly the best at it I've ever seen. Instead of allowing a five-on-four, or even sometimes a five on five with the opposing team building momentum, Prigioni will simply stop play and make the other team pass the ball in from the sideline. The 35-year-old rookie is not the most exciting player to watch in the NBA, and probably the fourth or fifth most exciting player in the Knicks' backcourt rotation, depending on how you feel about James White. But Prigioni's cool, constant deployment of his savvy is pretty gripping in its way. It’s called Elevator Doors for an obvious reason. My absolute favorite example occurs with Stephen Curry and the Golden State Warriors. As a big man holds the ball out on the perimeter, Curry receives a pin down screen on the wing. He uses it to casually meander towards the center of the court, presumably out of the play altogether. He then catches his defender off guard by darting up towards the top of the arc. The big man who had the ball has since dished it off to Curry’s pin-down screener, and is moving towards the elbow, where another Warriors big man is waiting. Curry slides between the narrowing opening between his two teammates like Indiana Jones. As soon as he passes, the screeners step together and block access for Curry’s man, leaving him wide open to receive a pass behind the three-point line. This play is not unique to Golden State, but it’s still beautiful for dozens of reasons, nearly all revolving around the fact that it leads to Steph Curry three-pointers, which are great. This award is a distant, more straight to the point cousin with Most Improved Player. This season was filled with players who came out of nowhere to shock and amaze, but nobody did so more surprisingly or impressively than Lance Stephenson. Stephenson is, to be fair, not totally out of nowhere—he was one of the nation's top prep players. But he was also a little-used, grumpy-faced bench player for his first two seasons in the NBA, and not a terribly good one. This year, though, he's been fantastic, upping his shooting percentage from 37.6% last year to 46% this year despite seeing a major increase in offensive responsibility. One year ago Stephenson was best known for acting a fool in the playoffs, catching a flying guillotine from Heat backup/hit-man Dexter Pittman and not going down. Now, after starting 72 regular season games for one of the league’s best teams, he’s more than relevant, and a legitimately exciting player to watch. I love basketball, and have watched it more or less non-stop since Halloween. The vast majority of players in the NBA play the game at a level that’s both inspiring and so physically improbable as to be ridiculous. I wouldn't watch so much if I didn't enjoy it so much. But then there are the others, the human headaches who play gracelessly or grouchily or chippily or in otherwise gruesome ways. My list is short: Ryan Hollins, Tyler Hansbrough, Spencer Hawes, Sebastian Telfair, and Brandon Bass, to name a few. But the player I find hardest to watch is one I once enjoyed watching a lot. That’s Kevin Martin, a whistle-dependant guard whose distinctively awkward, tricky, once-beautiful offensive game has decayed or metastasized or otherwise Gotten Really Annoying during his first season in Oklahoma City. On a team that's among the most exciting to watch in the league, Martin has revealed himself as an annoyance that disrupts the game’s flow. It might just be that Martin's style doesn't belong on a fun or good team. He’s still good at getting to the line and can shoot really well. But he’s painfully one-dimensional, and has honed that one oof-y dimension to a sharp point in OKC. As much fun as the Thunder are to watch, it's tough to watch Martin flop and derp and herk and jerk his way into cheap fouls 20 feet from the basket. It's hard to think of what the appropriate trophy for this award would be; for Martin, maybe, a canned ham with a dent in it. Martin flop and derp and herk and jerk his way into cheap fouls 20 feet from the basket. It's hard to think of what the appropriate trophy for this award would be; for Martin, maybe, a canned ham with a dent in it. Los Angeles and Los Angeles, Oklahoma City and Miami, even Phoenix and Philadelphia—each is competitive in their own right and with games that are rightfully hyped up days in advance.